Good evening and welcome to Marvelous Mondays 98! Since I can always be own over with a jar of peanut butter, I’m featuring Six Amazing Peanut Butter Recipes tonight. Click the links below the collage to view the recipes! Peanut Butter and Jelly Swirled Pancakes by What’s Cooking, Love? And here’s on of my own tasty peanut butter recipes: No Bake Peanut Butter Pretzel Magic Bars. Just click the image to view the recipe! So how was your week? Will any of you be attending BlogHer Food this weekend? If so, we should meet up for a bit! Ken and I are heading down to Miami sometime on Thursday. Since I only live about 1 1/2 hours north of Miami, it’s short, easy drive for us. Ken isn’t going to attend the conference part but he will be coming to the Saturday after party with me. We are kinda calling this a mini vacation – part of it we will spend together, part of it apart. OH, and did you notice? I got the new site design installed last week. I LOVE it! I hope you do too! On to the party now. Follow This Gal Cooks’s board Marvelous Mondays on Pinterest. Follow This Gal Cooks’s board //Tasty Recipes Group// on Pinterest. 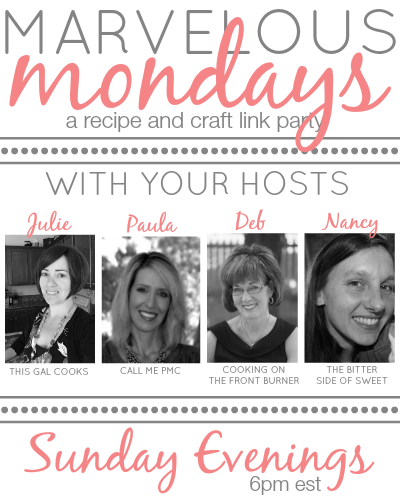 Please note that by linking up your posts and projects, you are giving This Gal Cooks, Cooking on the Front Burner, The Bitter Side of Sweet and Call Me PMc permission to use your photos in the featured posts and on social media outlets. All photos will be linked back to your sites and respective posts. Hi Julie! I had to run to the store today because I saw the bottom of my pb jar. gasp! How did I let this happen. I always have back up. Love the recipe round-up, as well as your new look! Thank you for hosting the party! One time I ran out. It was a sad time. I can’t believe I let that happen! Those peanut butter recipes look so delicious! Hope you’re having a great day, Julie, and thanks for hosting! You’re welcome, Julie! Thanks for joining us again this week! Mmmm, those peanut butter recipes look amazing – great features! Julie! I could eat just about all of these PB recipes you shared! Thanks for sharing ours! Thanks so much for featuring my Chocolate Peanut Butter Cake, Julie! Everything looks so incredible! You’re welcome, Ashley! Thanks for joining us again this week! Thanks so much for the party! I hope you had a great Mother’s Day! Thanks so much for the party Julie, hope you have a great rest of the week!! See you on Thursday!! EEK! 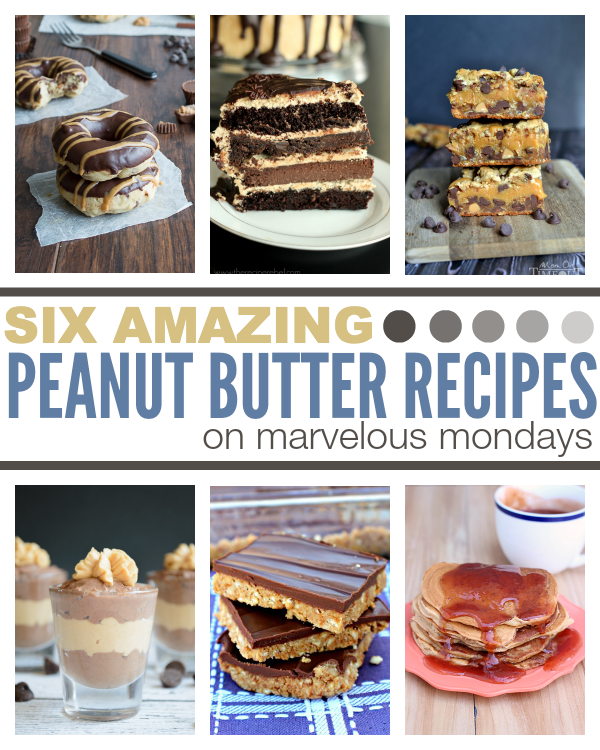 Yes indeed this does make for a marvelous Monday wit peanut butter recipes. Wow they are all winners to me. I do have fresh jar of peanut butter. I got hooked on your no bake ones. That means quick, delicious and popular in my book. peanut butter and chocolate is my favorite combo ever! yes to all of these. Cheers to one of the best creations ever! Peanut butter, you make my bad days good and my spoon happy. ;) Gorgeous round up, Julie, every single on of these recipes has my mouth watering! Julie, those peanut butter recipes look so good! Thanks so much for including my pancakes! Thank you so much for hosting!! :-) What an awesome peanut butter round up! 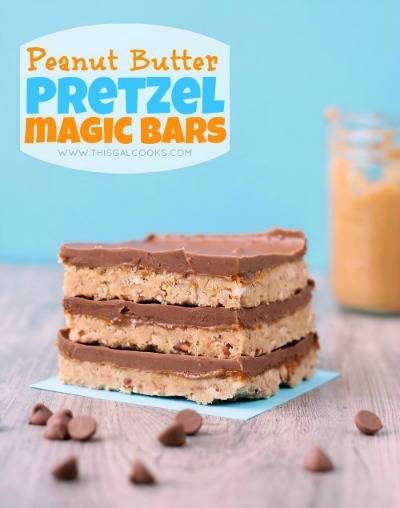 Peanut Butter Pretzel Magic Bars? Oh yeah…count me in!! You’re welcome, Prudy! Thank you for stopping by! Thanks for hosting! This week I’m sharing my Vegan Mediterranean Quinoa recipe. Oh that sounds good, Vicky! Going to check it out now! I see lots of peanut butter cookies being made in my future! My husband and I are both peanut butter lovers and have killer appetites for sweets. Thanks for sharing these great recipes! You’re welcome, Danae! I can totally relate to your love of peanut butter. Seriously, I keep a jar in my desk at work and eat it by the spoonfuls! Those peanut butter recipes look amazing! Thank you so much for hosting the party, Julie!